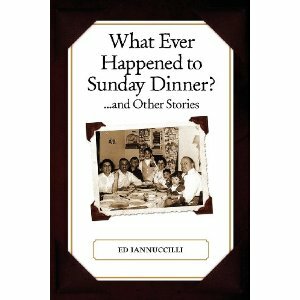 This entry was posted in Italian Americans, Writing and tagged Great Books, italian american, Providence, Providence Rhode Island, Rhode Island by pattytmitchell. Bookmark the permalink. Thank you, Patty. You are most kind. You bet! Looking forward to it! Wish I could be there for the talk, but again, being all the way out here in rural Idaho makes it a bit difficult to get to Rhode Island on a regular basis. I like the topic though. Even though I didn’t grow up in an Italian household (albeit I did have lots of Italian neighbors) we had a Sunday dinner tradition. My grandmother and uncle joined us every Sunday evening. They would bring dessert, rarely ate dinner with us, but chatted with us throughout the meal then shared dessert. It was an anticipated weekly event for us children because Nanny always had treats for us and sometimes pocket change. Big families and sharing with those families is something I love even though all the grandparents, and now the parents are gone so my children have no grandparents to share that experience with. Thanks for sharing! What a nice tradition! We had many Sunday dinners at my grandparents house and there was always good food and lots of noise! My parent’s home eventually became the hub for everyone on Sundays to bring their kids and eat macaroni and meatballs with my mother’s outstanding tomato gravy. Times have changed a lot since then, and now my mother rarely cooks pasta, where we would go through pounds of it each week. So sorry your children don’t have that- but judging by your work I’m sure they have lots of wonderful times with you that they will cherish always! Patty, thank you again. And for your reader in Idaho, I have this comment. I give many presentations of the Italian traditions, growing up with those traditions, remembering and recording them, etc. What I have found from every ethnic group is the same comment…”You told our story!” It is because everyone’s story is so very similar, Italian or not. They are traditions to be recognized and of which we should be so proud. They are what have made, and continue to make our country so great. Let’s champion them. Write, write…just as Patty is doing on her blog.